DIET, DESSERT AND DOGS HAS MOVED! PLEASE VISIT THE SHINY NEW DIET, DESSERT AND DOGS BY CLICKING HERE. Years ago, I visited a career counsellor to determine the profession best suited to my personality (turns out I should have been a Human Resources professional or a researcher). Part of the assessment was a test in which you enumerate your ten most prominent personality traits. To help me decide, the counsellor suggested I ask friends or family members who knew me well for their ideas, as they’d be better able than I to assess my personality objectively. Of course, if I stopped to think about it, I’d likely discover that a good portion of my typical dinner entrées lack grains, and I generally cook them up without another thought. So why, now that I’m actually trying to prepare interesting dishes for the Grain Drain, do I seem to be stumped? Enter old reliables. You know the type: like that gay pal you had as an undergrad, your perma-date who accompanied you to every important family function or work-related event; like that pair of respectable pumps you store in pristine condition in their original shoebox, just in case you’re summoned unexpectedly to a job interview; or like your most cherished friend, the one you could call without hesitation at 11:38 PM on a weeknight after you learned that Rocker Guy (he of the black leather pants) was returning to his old girlfriend, and you needed a shoulder to cry on (thanks, Gemini I). In the realm of food, these are my go-to salads. These are the salads we consume time and again, making minor adjustments depending on availability of local ingredients, what’s on hand in the kitchen, or shifting tastes as the seasons drift from one to the next. And since they are so familiar to so many of us, I thought I’d collect them here–a trio of fruits, roots and leaves (isn’t that what a panda eats? Or is it some weird grammatical construction?). Most of our salads in the DDD household are fairly rudimentary, tried-and-true affairs that probably appear on many of your own tables in slightly varied formats. Tossed greens, coleslaw, three bean–they’re comfort foods you turn to when cooking feels like an onerous task, the dishes you could whip up without a recipe, the ones that over time, perhaps, become your signature dishes. Even if they’re tweaked a bit over the years, they still retain their original essence and appeal. These recipes are as reliable as that newspaper rolled in its heavy, scuffed elastic band, delivered to your front porch each morning; as basic as your little black dress; as comfortable as the warm sand between your toes on a sunny beach. First up is a standard greens-and-veggies combo. This Greens with Hearts of Palm and Pine Nuts is the same salad that accompanied my Sweet Potato and Kasha Burgers a while back, about which some of you expressed an interest. The colors are remarkably vivid, and for a salad that’s this easy to make, the taste is astonishing. This is one of my all-time favorite green salads. I also enjoyed a coleslaw that I’ve been preparing since my twenties. Originally the recipe of my room mate’s older sister, it was the first in which I’d tasted fruit (raisins) in coleslaw, and I was instantly smitten. In those days, I made the dressing with a combination of plain yogurt and mayonnaise, but I find that any vegan mayonnaise works just as well. It provides a lovely tang along with the soft sweetness of chewy raisins and juicy crunch of fresh cabbage. Both refreshing and satisfying! Finally, I mixed up a three bean salad–you know the one, the centerpiece at all those family Bar B Q’s from your childhood, the same one that occupies a huge bowl on almost every restaurant buffet. I adapted this one from Chuck and Gurney’s 125 Best Vegan Recipes, as I couldn’t find my original (cadged from another graduate student way back during my PhD). I imagine you could substitute almost any beans you like, but for me, it wouldn’t be “classic” without kidney beans and chick peas. These are the multiple-encore salads in our house–and you can count on a great performance from all three. And since Salad Number 3 in the lineup is a perfect choice for Lisa and Holler’s No Croutons Required event (this month, the focus is on soups or salads with beans or legumes/pulses), I’m sending it along there as well. You can check out the roundup after the 20th of the month. Because the vegetables here are so radiant on their own, I snapped the photo before dressing the salad. With so many flavors coexisting in harmony here, the dressing is actually very light. And you can vary virtually every part of the salad: use your favored greens instead of the organic mixed greens; use walnuts or almonds instead of pine nuts; or artichoke hearts for hearts of palm–it all works! This is a perfect side dish for a Bar B Q or light lunch on a really hot day. It makes a great partner to classic potato salad. The fresh dill adds some zest to this classic salad. I love the sharp pungency of the dressing in this salad. Added fresh mint and tarragon elevates it beyond the buffet table. Oh my goodness! How refreshing these salads must be. Some lovely “proper” meal like salads here. I shall be trying some of these to vary my lunch menu! You have reminded me that I need to write up my usual bean salad for No Croutons Required. I am looking forward to the round up on this one. Guess it’s a function of living in a traffic nightmare of a state. There’s always an accident somewhere tying up the highways. By the way, your old reliables look fantastic! I don’t have any salads like this in my repertoire! At least not out of my head. I used to make egg salad (but that was for sandwiches) and now I’m trying not to eat as many eggs. They all look yummy! Especially the coleslaw one. I am happy to hear that you are enjoying your salads and that the cleanse is going fairly well. Salads are definitely a favorite and an old stand by for me as well–I love them! I see you have come up with another use for mint 🙂 All three salads are perfect for the hot summer months. Thank you for submitting this bean salad to our event. Yum. Yum. Yum. These all look delicious. I’ve got a head of cabbage in my fridge just waiting for your recipe. Raisans and walnuts in cole slaw — a brilliant idea! Those are some nice looking salads. I like the use of the dill in the coleslaw. Thanks for posting these salad recipes. I love a great mix of color and texture, just as you have done. I also read every word of your detox post and even though I eat really clean, I learned so much. I appreciate the effort you put into that post. You’re doing VERY well, I must say. And all those luscious colours look incredible. These look so good- which one do I make first? Thank you for sharing your salads, and pictures.I know I can “count on you” for a great post! The salads are always right up there on my priority list and anything with chick peas is always a winner. I thought those were hearts of palm – used to eat those in my salads all the time but haven’t bought any in a long time. 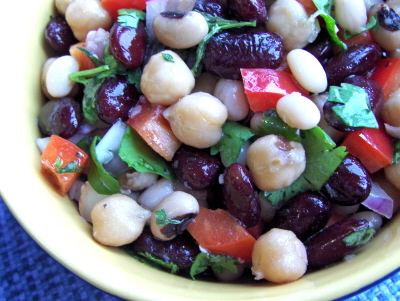 I love the 3 bean salad, though I might substitute the kidney beans (not my favorite). I’m going to try your recipe tonight for your chocolate version of the lara bar. I was forced to by regular Hershey’s cocoa powder, but will venture out to another grocery store that will carry better powder. Will let you know how it goes. Yum! Great pictures and that Three Bean Salad really appeals to me. I think I’ll make it this weekend. I think it’s great you’re doing a cleansing diet. I was supposed to do a full month detox diet with a brief juice fast in the middle, but that failed miserably. It wasn’t actually due to laziness or lack of will power. It was simply because the stress and drama in my life started snow-balling at the exact moment I needed to relax and take care of myself! So, perhaps after the dust settles, I can get back to it. I was never a ‘salad person’. I always found them to be boring and drab. But, then again, maybe it has to do with the fact that I always ate lettuce and tomato salad with icky Italian dressing. The only thing that could ever spruce it up for me (as a youngling back then) was sharp cheese. Now I’ve finally realized how awesome salad can be. I even went to an all-raw, fresh, organic restaurant last night that served some of the BEST tasting salads I’ve ever had. Yet… I just can’t bring myself to make them. In truth, salads can be very filling and energizing. But the last thing I’m thinking when I’m absolutely ravenous and my blood sugar’s extremely low is, ‘You know what I could go for? A big salad!’ No. I’m thinking bread, pasta, salty, sugary, greasy madness. You’d think with such bright, beautiful colors that are meant to attract us and our appetites, we’d be all over it. But, no. We humas would rather white food. White, boring food. Ah, where is the sense in that? But you know what? You’ve inspired me to get on the salad wagon. You are very right about the comfort in it. It is simply the guilt-free way of filling your belly and saving your energy (not having to cook is an easy day indeed!). Well, nevermind SAVING your energy, but adding to it. I think I’ll give a go at some of these recipes. It’s about time I stop abusing my body with junk! Sorry for the extremely long, rambling comment. You just got me thinking… a lot! Always nice to have a cold, crisp salad on a hot day, isn’t it? Hard to believe you hated salads when you eat so many veggies now! But I guess “veggies” and “salad” aren’t necessarily synonymous. I’ll look forward to seeing your version of the bean salad–there are so many, and they’re all good! So glad to give you something new to try! I adore egg salad too and used to eat it all the time when I was in university. Let me know how you like these if you give them a try. Yep, that mint sure does come in handy! 😉 Looking forward to another great roundup as well. Aww, thanks so much! And I can see why you won that vote 🙂 . Thanks! I’m a big dill lover, and I think it adds a lovely flavor to this dish. Very perceptive of you. Yes, actually, I DO have a bit of a “split personality,” according to my HH–after all, I’m a Libra, so I’m always shifting between two opposites in an effort to achieve balance (still eludes me, unfortunately!!). Aren’t hearts of palm great? Once I discovered them, I put them in everything for a while. So glad you’re going to try the nibbles! Let me know how they come out (and I’m sure Hershey’s will be fine–is there a reason it wouldn’t be?). Glad you like it! Let me know what you think. I love having reliable foods that I can count on when I don’t have time to think. Now I must make your reliables, mine… because they all look so delicious! I don’t eat enough hearts of palm and I love them, must start putting them on salads. These are truly classics. For whatever reason, it seems like I’ve been turning on the oven for almost every meal, which is ridiculously considering how hard my AC is working. The coleslaw in particular sounds really good! I’m a big hearts of palm fan–and you’re right, we don’t use them often enough! I know what you mean about that a/c running. I think I just couldn’t get the energy together to heat something up!